Goblins and ghouls, oh my! With summer coming to an end, we're gearing up for one of the most fun reasons to pull out our craft mats - Halloween! In our latest edition of Make it with Mod Podge, Cathie & Steve share with us seven spooky crafts to create your very own haunted house party. Watch Cathie & Steve show us how easy it is to transform the everyday into truly scary stuff. 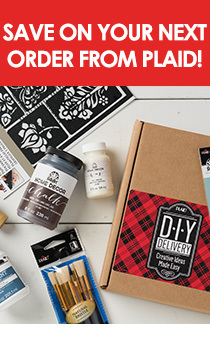 Here are a few of the projects you'll learn to make in the video - find links to the full project how-to below, and click the image to shop all the Plaid DIY supplies. Customize a glass Cake Plate to display the sweetest treats. This showstopper of a Skull is sure to be a conversation starter! After the party's over, use it to adorn your mantle. Hocus pocus! This Potion Bottle is super easy to make and a grouping of them make a perfect centerpiece! This is such a fun alternative to a boring bowl - Cathie & Steve use a book to craft a "Spell Book" full of candy surprises. Light up the night with a cool crackle finish on a Pumpkin Marquee light!